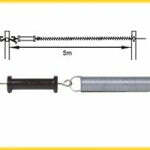 There are numerous styles and materials for making an electric gate, Spring Gates, Retracting Gates, Bungi Cord gates, high tensile wire or self-constructed gates using tape or rope. The least successful gates occurred the year we used bungi from a company, and the bungi turned out to be a real lemon. It stretched and sagged so fast that our son-in-law said he was certain he heard the lead horse telling the others as he installed the gates “don’t worry girls, just give it a couple of days- the gate will sag to the ground and we’re out of here”. To remove the sag we kept tying bow knots in the bungi until it began to look like one continuous knot. 1/. Electrified gates should only be connected to the source of electricity by the hook side of the apparatus. When the gate hook is disconnected from the gate post, this then makes the gate safe and not electrified. Should it then touch the horse as it is going through, it will not be affected. If the gate drags on the ground it will not drain energy from the fence. 2/. DO NOT use the gate itself to transmit power from one side of the gate to the rest of the fence. The gate hook has a very poor connection where it is hooked over the gate insulator that will reduce the power to the rest of the fence. (Remember the weakest link in the chain.) Rather use an Underground High Voltage Insulated Cable to transmit the maximum amount of energy to the rest of the fence. Also the rest of the fence will be disconnected when the gate is open. This may be buried as supplied or for better protection from damage by hooves in this high traffic area it could be inserted into a pipe and buried. 3/. 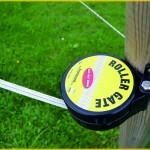 Use a Gate insulator to connect to the fence and the gate handle will hook into the other loop. The spring or chord may be attached to a ring insulator screwed into the opposite gatepost but not connected to the rest of the fence. 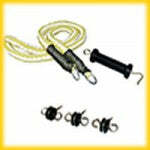 It is possible to electrify a wooden or metal gate by stringing a length of wire between two insulators. 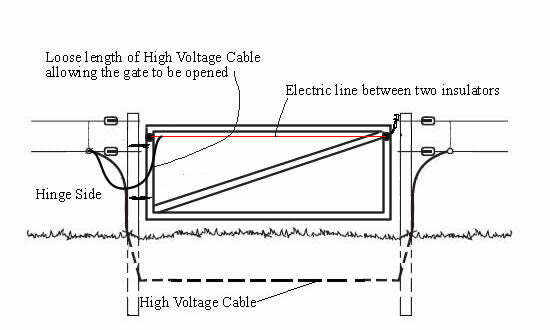 This wire is then connected to the rest of the fence by a loose length of insulated High Voltage cable that is long enough to allow the gate to open without snagging. This may be seen in the diagram below.